You have to eat lunch every day. But why spend your daily opportunity on yet more fast food when HoCo is home to a healthy number of restaurants which offer a genuine taste of international cuisine? In today's (very first) World Lunch, we start out at the absolute entry level on the international scale -- pizza and lunchtime Italian fare. Rather than settle for overpriced mall crap that is more suitable to captive audiences on the Jersey Turnpike, you can spend less and get real Italian. 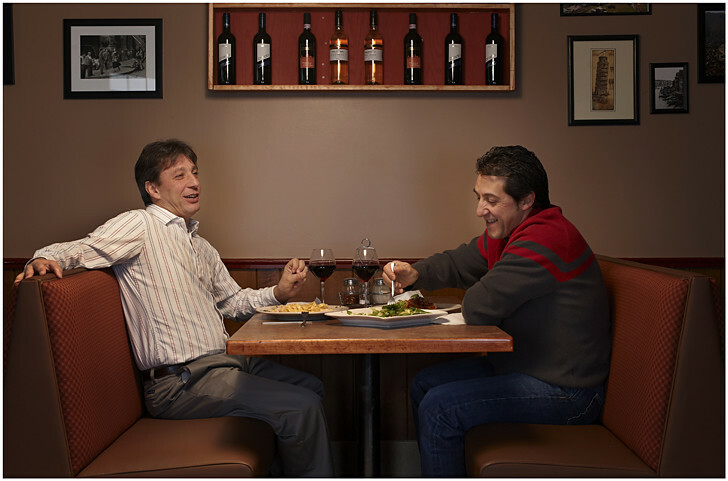 Shown above are brothers Gianni (left) and Carlo Morra having lunch at their Dorsey's Search location, Trattoria Amore. (There are two other restaurants, in King's Contrivance and Waverly.) Gianni and Carlo grew up in Italy, where their father worked in an Italian restaurant before heading out on his own as a baker at the ripe old age of 17. 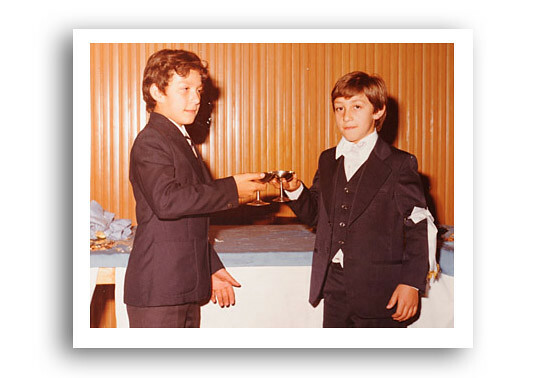 Here are Gianni and Carlo back in the day, in Italy, after their first communion. The after party was of course held at their local Italian restaurant. Suffice to say these guys know about good crust, among other things Italian. And, unlike Dominos or Pizza Hut, they don't have to stuff their crust with cheese for it to be delicious. In fact, if you buy a single slice (which you can do at all three locations) they will finish it off in the oven before serving it to you. Whether or not the pizza is warm has nothing to do with it. It's because they do not fully pre-cook the slice pizza, leaving a thin strip of uncooked dough in the center which gets finished off right before you eat it. If you are so inclined, I highly recommend trying the sausage pizza. The suppliers are chosen very carefully -- this is not a commodity operation. In fact, many equate the pizza here to the Brooklyn variety, which is high praise indeed. But as good as the pizza is, there is one problem. It will likely stop you from venturing further into the menu, which is a shame. When you are ready, try the Ravioli Aurora with it's cream rosé sauce. 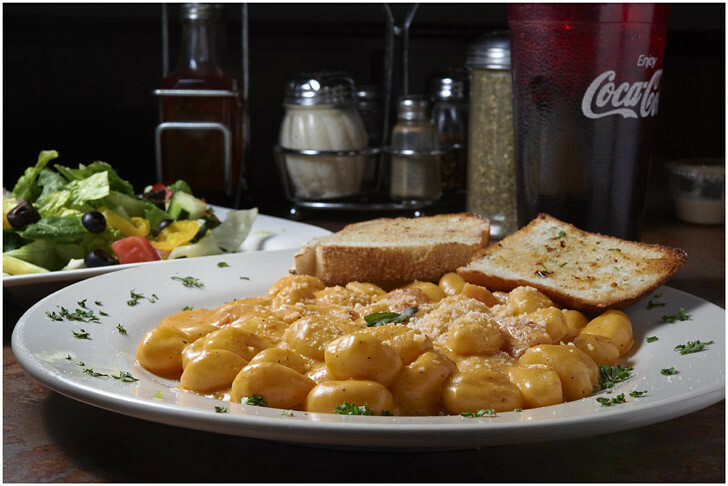 Better yet, go off-menu and try the gnocchi with the aurora sauce, pictured below. Each of the three locations is a little different. For instance, I prefer the salad (actually, the dressing) at King's Contrivance. But one thing you will find at all three places is soccer. Columbia is a soccer town and the Morras are soccer people. There is usually a game on the TV mounted over the counter. And for a full taste of soccer this place is a must-visit when the FIFA World Cup is being played. They start out with flags from every country entered, and slowly remove them until but one remains. When Italy won the World Cup in 2006, it is hard to describe the joy that permeated the place. And equally, the agony of 2010 when Italy was ousted in a back-and-forth heartbreaker of a game. It was almost unbearable to be there. Oh, and if Italy is playing in the cup, don't expect their full, 100% attention as restaurateurs. But again, that's just one more thing that makes it closer to the real European experience.